So let me fill you in here real quick. 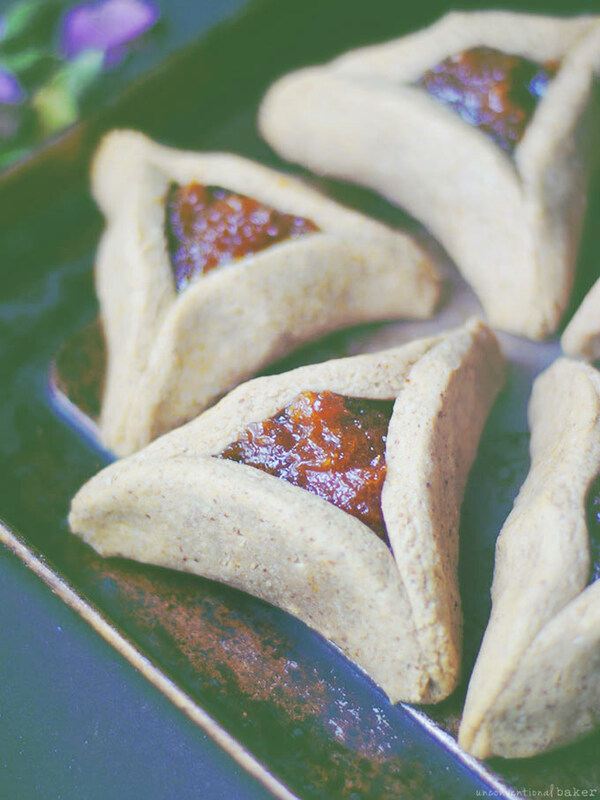 A hamantaschen or hamantash cookie is a triangular cookie traditionally made for the celebration of Purim. Something like a shortbread pocket filled with a sweet filling — usually apricot, or poppy seed, raspberry, etc. 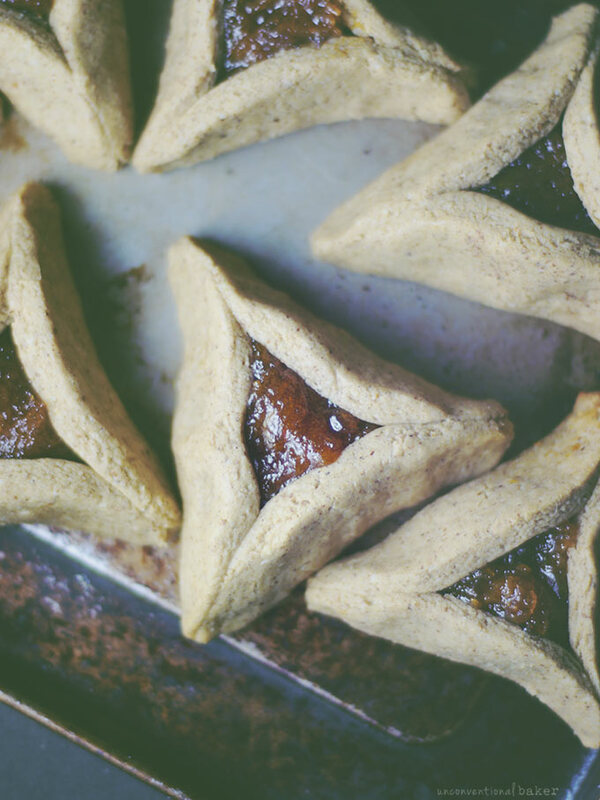 While we don’t celebrate Purim, I do love these little fellas and so does my husband… so last year I shared a recipe for some poppy seed filled ones. The poppy seed filling has always been my favorite, and the cookies turned out wonderful. … But for some reason some of you have been struggling with the recipe, and also over the year I’ve been into simplifying the recipes more and more anyhow, and so these cookies were up on my list of things to remake into something easier… and tastier ;) And success: delicious batches of dairy-free, eggless, refined sugar-free, oil-free, gum-free, nut-free, (insert many more “-free”), gluten-free hamantaschen coming your way ? This time around I opted to make some apricot-filled ones and share a few tips / tricks for success. If you prefer the poppy seed filling though, check out the other recipe which I’ve now updated to reflect the new and easier to work with dough. That poppy seed filling is just the best! 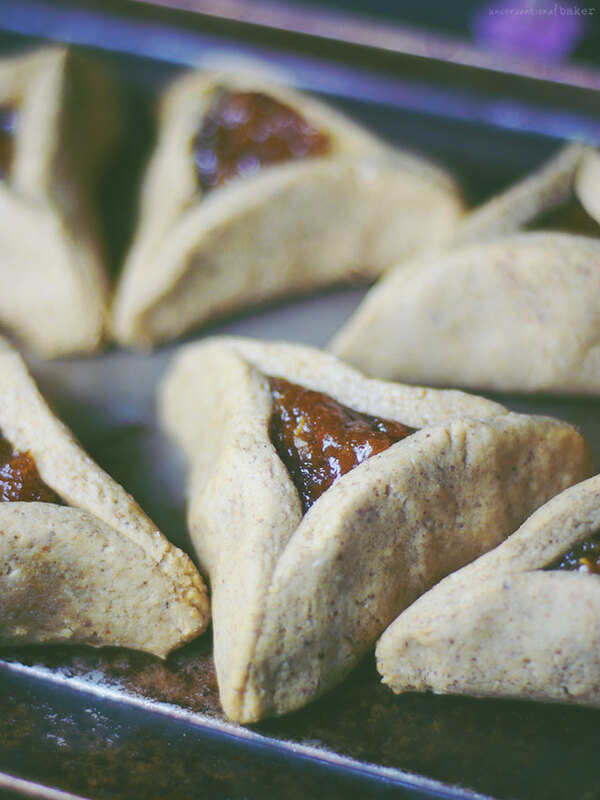 Hamantaschen take practice to perfect; definitely not a recommended cookie to attempt for the first time for the purpose of impressing guests… That said it’s a most delicious learning process ;) that will likely take a few trial runs to master. There are some common #hamantaschenfail snags to be aware of… Let’s start with the corners — seal them well so they don’t open up on you as the cookie bakes. Also keep the filling to the center only, leaving the edges clear while filling to help those corners seal properly. The dough consistency is important. If it’s too dry, the cookies will crack as you assemble them. Make sure it’s pliable, stretchy, and soft, but that you can still easily roll it into a ball. After processing, take a small scoop into your hands and play around with it: roll into a ball, flatten, and try to carefully fold the dough — is it bendable? Good to go. Does it snap in half at the gentlest of folding? Return to the processor, add a bit more water and try again. 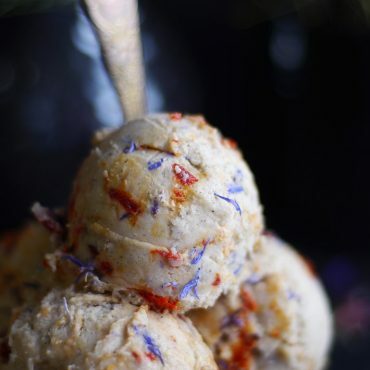 The variance can happen here because different nut and seed butters (even different batches of the same variety) can have different consistencies, so that is where adjusting things by adding more or less water to the dough comes in. Extra tip: wet your hands slightly when handling the dough — makes it much easier to work with. Don’t be tempted to overfill those cookies. 1 tsp may not seem like much filling at first, but it’s just right. Patch up any minor cracks or tears before baking (just as you would with a pie crust, etc.). 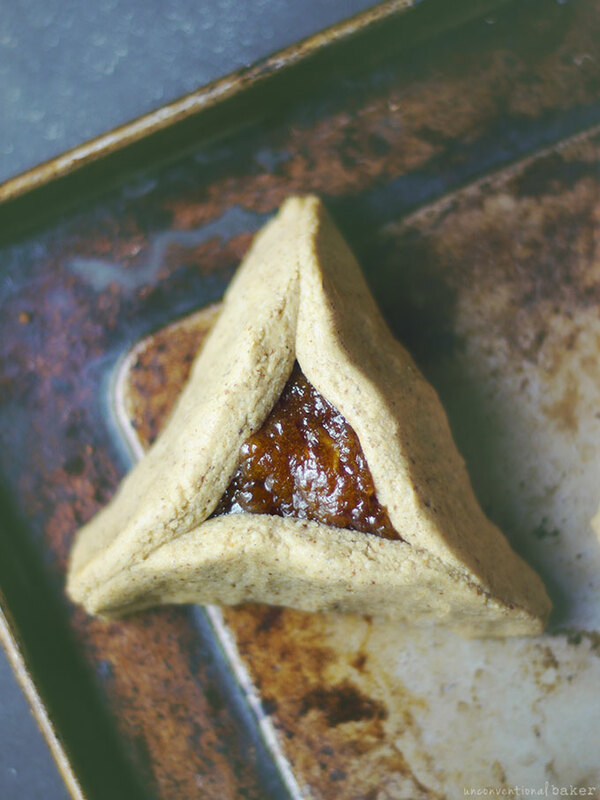 A gluten-free and dairy-free version of the traditional triangular Hamantaschen cookie filled with sticky apricot jam. Wet your hands a little and lump ½ of the dough into a ball, kneading it lightly. Flatten into a disk and place on a piece of parchment paper (if at this point the ball is cracked all around the edges, you’ll need to return it to the processor and add a bit more water and process again — that’s an indication the mixture is too dry. A bit of cracking is normal though). Cover with a second sheet of parchment paper and roll out into an ⅛” thickness. Cut out circles using a 2″ round cookie cutter (or a glass rim). Transfer the cookies onto the prepared cookie sheet. Place about 1 tsp apricot jam in the center of each circle. Then lift two edges of the circle up over the filling and pinch to seal a “corner”, then life the remaining side of the circle and pinch to seal the other 2 corners. Make sure you seal those corners well, as otherwise the cookies will open up as they bake. Touch up any cracks at this stage. 5. Repeat step 3 & 4 with the other half of the dough. Bake in a pre-heated oven for 13-15 mins (the longer they bake the crunchier they’ll be). Cool on a rack completely and enjoy! Disclaimer: this post contains affiliate links to the St. Dalfour jam I recommend using in the recipe. Do you think almond butter can be used instead of sunflower? Audrey, I am excited to try a hamantaschen that both my Son and I can eat. Thank you for posting. What type of sunflower seed butter do you use: the ‘regular’ sweetened version, or the unsweetened version? Hi Rebecca. thank for the awesome recipe, can’t wait to try it out this year. Do you think I could sub oat flour for rice flour? 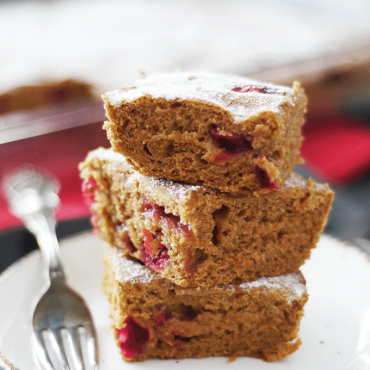 I think oat flour could work — that would be one of my next go-to’s here if I had to come up with a substitute (I also love sorghum). Thanks for this recipe. With Purim coming up I was thinking it’d be fun to make some Hamantaschen. I’ve made the traditional kind in the past (& yes it’s very important to not get carried away with too much filling & to pinch them firmly). I wanted some vegan gluten free ones & these look like they’ll fit the bill perfectly. I think I’ll fill the center with some lovely raspberry jam that I have. I’ve had them with apple & also a chocolate filling in the past – so good. Thank you! That sounds lovely, Rachel. I like filling mine with raspberry jam sometimes too :) Never tried apple, but that sounds delicious. There’s really a whole workshop dedicated to these little cookies?!? I’ve never even heard of them, but I totally feel like I’m missing out now! They look scrumptious even if I had no idea how to pronounce the name. Thanks for including that ? Hehe. Yes! Well, they’re like a holiday classic — *the* cookie of the event. So those celebrating definitely need to know how to make them and it can be a bit tricky… So I can see that. It is funny though if you’ve never heard of them — I totally get that. Delicious though (as one would expect a cookie + jam to be ;) ). 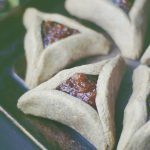 I’ve never tried to make hamantaschen before, and in fact, only heard of them last week – where have I been! I’m thinking these would be a good weekend recipe test for me! Yours look so gorgeous! hi. can i use a nut butter instead of using sunflower seed butter? Yes, for sure. The only thing is you may need to adjust the amount of water (as per instructions) until you get the right dough consistency. For example when I tried with the sunflower seed butter I only needed 1/3 cup water, but when I tried it with peanut butter I needed 1/2 cup water. So just add little by little until you get the right dough texture (see tips above recipe to know when it’s right). Such beautiful cookies Audrey! I love the sunflower seed butter you used and apricot was a lovely choice to fill them with! A cookie I will sure have to try some time!! They seem fun to make!